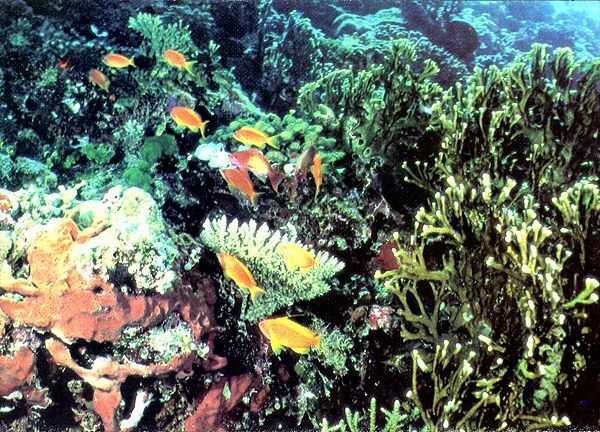 A coral reef is an unique natural association, oasis, created nature in the desert of ocean. Islands, formed corals, make considerable part of area of dry land. Atolls, submarine jars, dangerous for navigators, reefs, bordering islands, - all of these giant buildings in spaces of tropical Maureies build coral polypuses are shallow animals. Water hides life of coral reef, mysterious and beckoning. In the thickets of corals find itself a house and defence marine lilies and actiniae, stars and hedgehogs, numerous pearlworts and sponges, shellfishes and spiny lobsters. 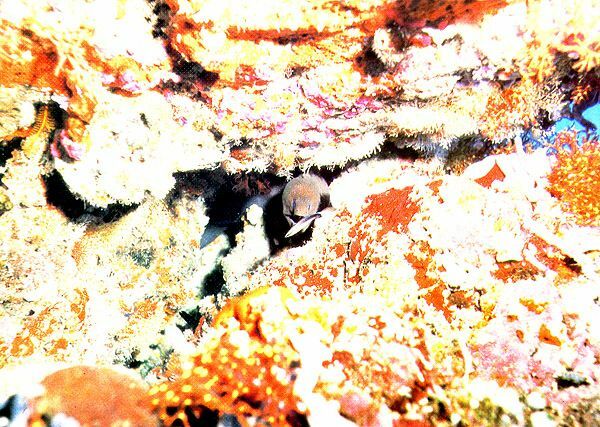 Most inhabitants of reef are hidden into the colonies of corals, but it happens that a colony becomes overgrown with animal from every quarter. In whimsical "coral gardens" it is always possible to meet varicoloured flocks from fishes-butterflies, surgeons, parrots... Some finfishess dwell on strictly certain territory and have the refuges in caves or grottoes of reef. It is moray (Muraena), finfishess-soldiers, stone perches, scorpion fish (rockfish). 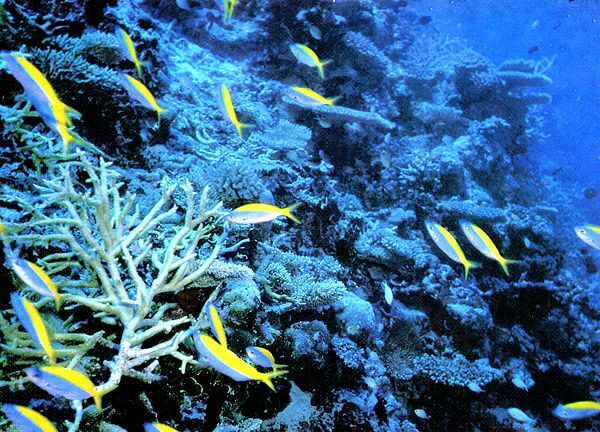 But the most important habitants of reefs here all the same are corals: massive, as stone tables or mushrooms, branchy, fragile, look like antlers; softly swayed, ploughed round as if. They are painted in bright dark blue, red, violet, yellow-green tones. I am among them and poisonous, burning. One corals can not live without light, other meet only on depths, where light does not almost penetrate. How do coral reefs grow? Some types of corals very quickly are ten of centimetres in a year. 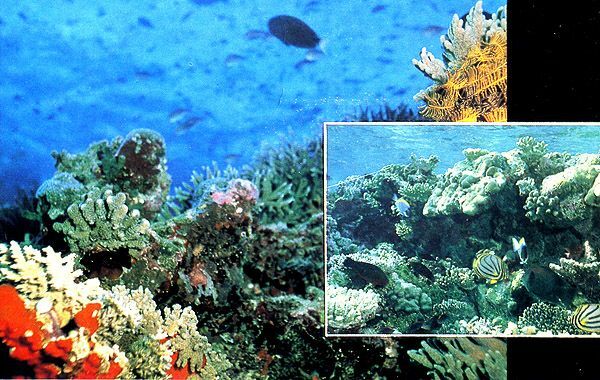 Known French researcher Jak Iv Kusto, going over the years back to the place of location of the submarine station in the Red sea, was staggered that coral jungles were quite transformed by buildings. But on the whole reefs grow slowly are less five meters in thousand years. Gales storm, destroying them, influence on speed of growth of corals, exterminating flows, darkfield luminosity (low-light-level conditions) and dirtyness muddiness. Shellfishes are worms, echinoderm, sponges, water-plants, above-ground on a reef, also endow in building of this grandiose building. I am on a reef and animals, cooperant destruction of corals. It is terebrant shellfishes and finfishess which nibble coral polypuses. A starfish is a crown jewel - also predator, feeding on living corals. Mass reproduction of these stars not so a long ago threatened safety of pearl of nature - the Large barrier reef, located along the banks of Australia. There are not living coral reefs in the CIS, however widely widespread minerals are - in Urals, Caspian, Ciscaucasia and many other places. The study of ancient reefs is very important, because near third of all of oil in the world obtained wherein there are fossil reefs. 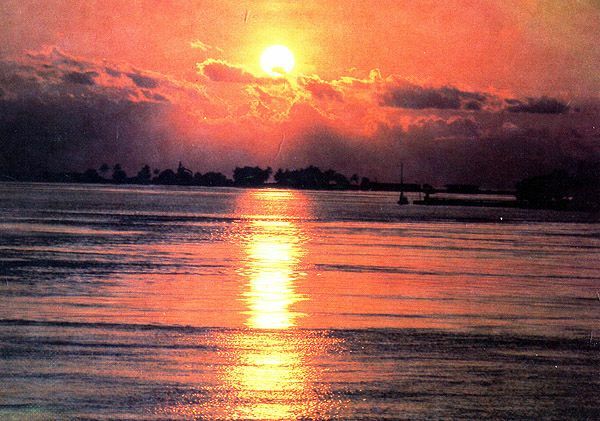 However and some modern reefs in Polynesia, south-east Asia and Caribbean sea are perspective for the booty of oil. Research of conformities to the law of development of coral reefs allows in the future to create highly productive marine economies. Much yet riddles in life of coral reefs. 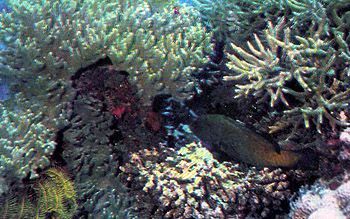 Coral reefs are a laboratory in which nature does experiments on ecology and evolution of animals and plants the family. Therefore interest of scientists is so great to the fauna and flora of these unique corners of nature. Coral reef with a lagoon in the middle and appeared the high elegant barrels of coconut trees, in obedience to the classic theory of Ch. Darwin, in place of going down at-sea volcanic island (formed on a volcano). A surrounding an island reef ring gradually grew breadthways and height. 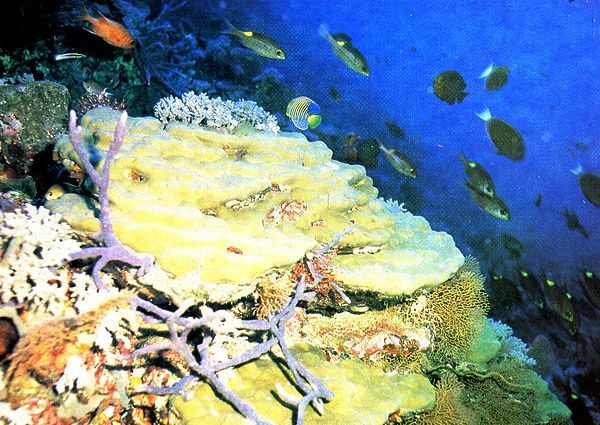 Marine storms were destroyed by corals, threw out their wreckages and sand on the top of reef, coming forward overwater. 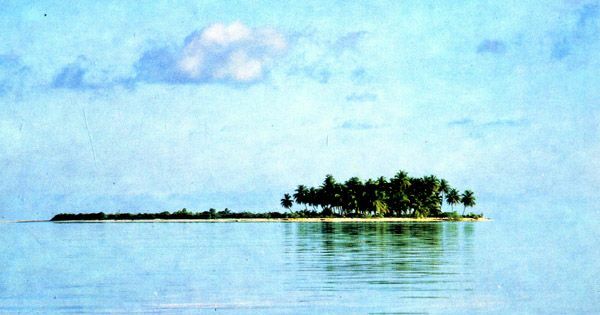 An atoll appeared so gradually, on the sandy bank of which winds were brought by seed from nearby islands. Many coral islands of the Maldivian archipelago are uninhabited - there is not fresh water. But from time to time there the habitants of nearby islands swim up to on the wind-driven boats, to take the crop from coconut trees. 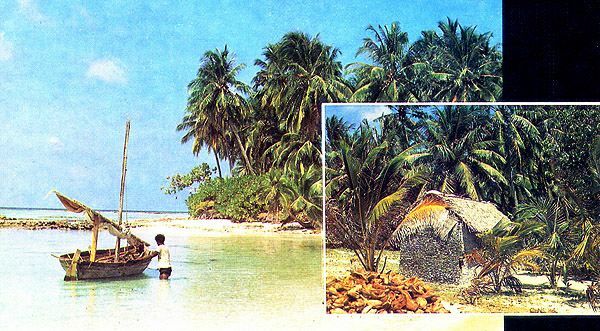 Little cabins from a coral limestone, covered palm leaves, serve as them the temporal dwelling. EXTERNAL SLOPE OF REEF. If to look at a coral atoll from above, it is possible to see circumferential his white ring of suds. It is an edge of reef (a flat top of podvodonogo volcano is a ring round a volcanic crater). 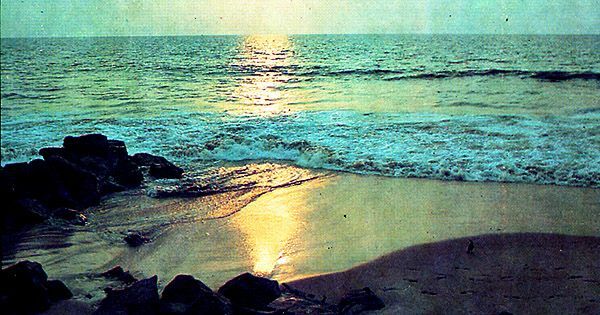 He is formed massive, durable corals and lime water-plants. From exteriority of reef rapid luciany scamper about during a calm, finfishess-surgeons, varicoloured finfishess-butterflies. On the warmed up shoal the external slope of reef is covered branchy lime corals - they are most popular for jewelry and souvenirs. They grow very quickly, forming picturesque submarine gardens. Natural volnolom. The steep slope of reef begins on a depth 5-10 meters (sharp lowering downward, slope of volcano). 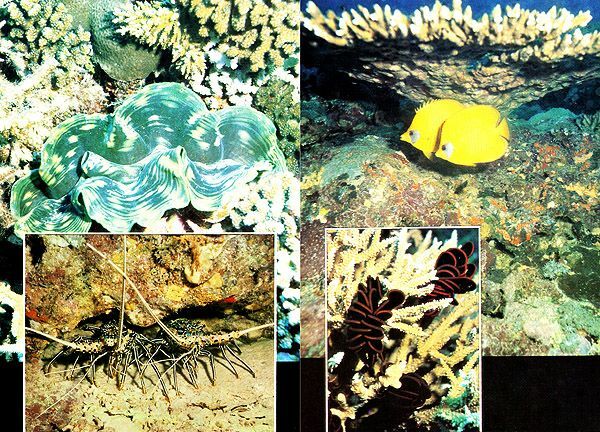 Here branchy corals form toothed relief, look like a comb. Such structure is very steady. Beach-combers, meeting with a coral comb, gradually lose force and finally break against the edge of reef. Not for nothing at building of volnolomov in ports builders use toothed constructions. Emperor grouper perch (Perca). Among the unusually pied painted coral finfishess (on a background corals) the magnificent dress of an orange stone perch of merou at once comes into a notice. Not for nothing he is named yet is a perch of pavlinoglazyy. But water does not skip red rays, and on the depth of merou looks brown-black. Only at a survey, on an instant lighting up a lamp-flash submarine coral landscape, it is possible to see the real kaleidoscope of paints. Corals of the most various forms and remind a vegetable garden in the middle bar of the CIS. Elegant marine lilies (dark on a photo) are the most ancient representatives of echinoderm animals. 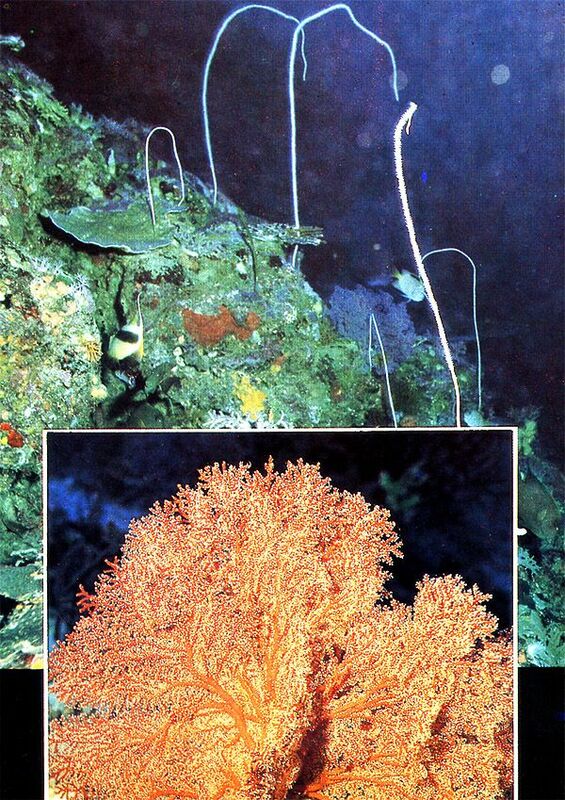 Usually they sit on light corals, firmly sticking to short tendrils, and remind flowers. If tidewide flows are very strong and a lily can not hold out in place, it begins to swim, rhythmically flapping flexible, look like feathers rays. This strange dance proceeds until a lily again will not grasp for trustworthy support. Fossil marine lilies are popular. Moray (Muraena) IS IN SUBMARINE CORAL GROTTO (underwater). Two-meter big fish, sitting in a submarine grotto, meanders a zmeeobraznym body and opens a mouth, demonstrating sharp recurvate teeth. The ill fame of moray (Muraena) be under an obligation the look. Actually they do not attack of people. Muraena moray feed on fish and try only to frighten an uninvited new-comer, protecting the home. A little guban goby confidently feels before a dental fall. Murena will not touch the striped hospital attendant which with application removes vermin from its derma and cleans teeth. IN LAGOON. On the internal side of island, in a lagoon, even during a gale agitation is not strong (crater of volcano). A lagoon usually unites with the external edge of reef narrow and deep passage-ways which fresh, rich in oxygen salt water acts on. The gently sloping midwall of reef is covered the jungles of corals with thin fragile sprigs, water-plants and meadows of submarine herbares which bright fishes frisk among. TRIDACNA AND SPINY LOBSTERS (on the left). 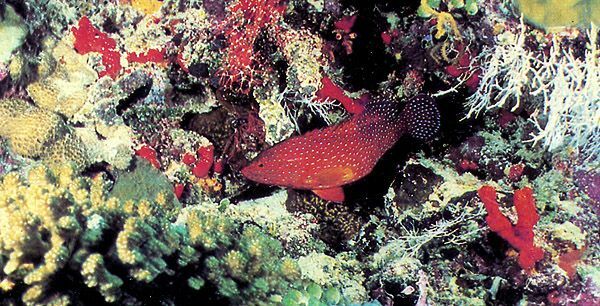 On small depths among corals it is possible to meet tridaknu. About these giant bivalves tell legends, comparing them to the traps for diver. Actually tridakny slowly close a shell and does not present a serious danger. The spotted dark blue-green mantle, salient for the edges of shell, is painted growings in it one-celled water-plants. Spiny lobsters are settled in burrows, formed in a coral limestone. Meat of these large crustaceas is delicious and is the important article of export of the states, located on coral islands. CORALS OF Acropore (on the right). 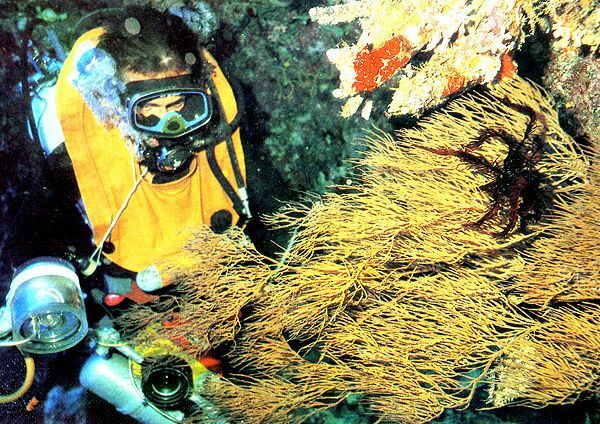 On a depth 20-25 meters it is already impossible to meet such variety of lime corals. Here gloomy, and many heliophilous kinds survive hardly. It is explained that there are one-celled water-plants of zooksantelly in biological tissue of corals, which is need a sunlight. In these terms corals of acropores are formed by forms, look like an umbrella. Under such umbrella finfishess-butterflies are gladly hidden. The branchy forms of akropory are formed on a small depth - light of a Sun yet penetrates under water. Popular corals. FIERY CORALS-millepores (on the left). Most corals are not inoffensive for a man. Wounds from cuts long it is not healed sharp coral branches. Coral polypuses feed on microscopic organisms (predatory) and catch them by urticators, supplied poison. 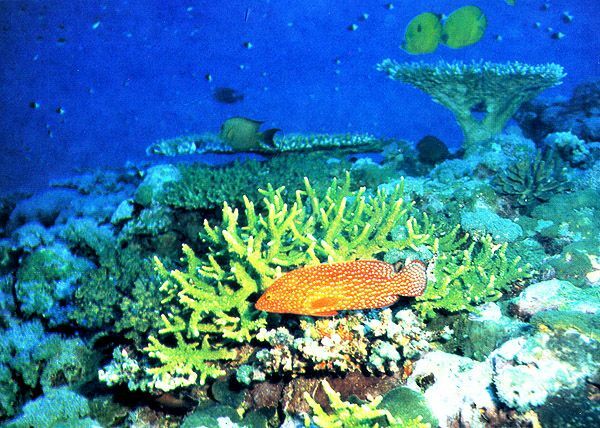 Fiery corals, widespread on coral reefs, are most dangerous. A touch to them causes burns. Even swimming next to these corals, an aqualungist feels burning on a derma. SPONGES (on a photo on the right). Depths over 30 meters are an expanse for sponges. These primitive metazoans are various: elegant, look like small vases, shapeless, by a crust coverings the surface of the lost corals, massive as if small casks, yellow, grey, red, violet. 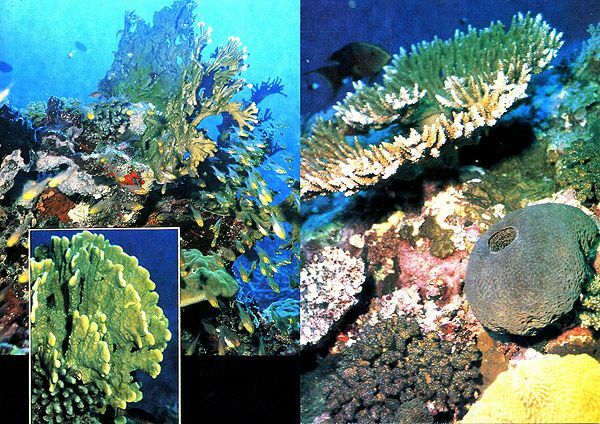 Usually sponges do not harm corals, but there are terebrant sponges, destroying them. At the banks of Japan glass sponges are obtained with a delicate silicic skeleton. They are used as jewelry. Toilet sponges the skeleton of which consists of horny matter, until now valued highly, in spite of wide distribution of artificial, synthetic. Gold-lined snapjack (luciane) And FISHES-CLOWNS (Amphiprion, on the left). Gold-lined snapjack (luciane) examines the brightly painted nudibranchiate mollusks which are probably uneatable with interest. These finfishess usually stick to nearby from a reef, searching a forage among corals, but sometimes going to the coveys and considerable distances swim. Anemonefish-clowns (Amphiprion), on the contrary, homesters. They do not sail much from actinia, to the office worker by him by reliable refuge. 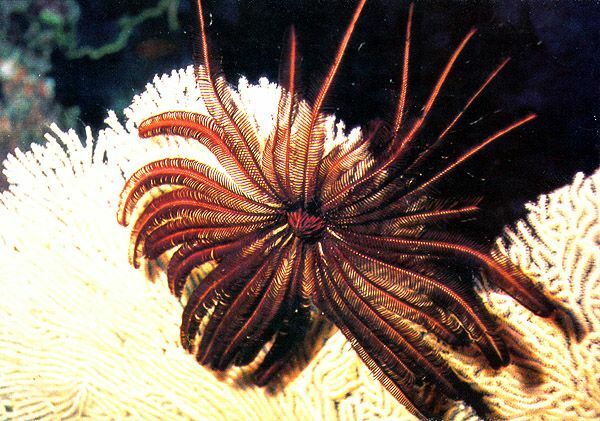 The tentacles of actinia are poisonous and kill touching to them fish, but does not cause harm fishes-clowns which are hidden among them at the least danger. Sometimes amfipriony bring the forage of actinia even, as if in gratitude for defence. STARFISHES (sea stars, Asteroidea, on the right). 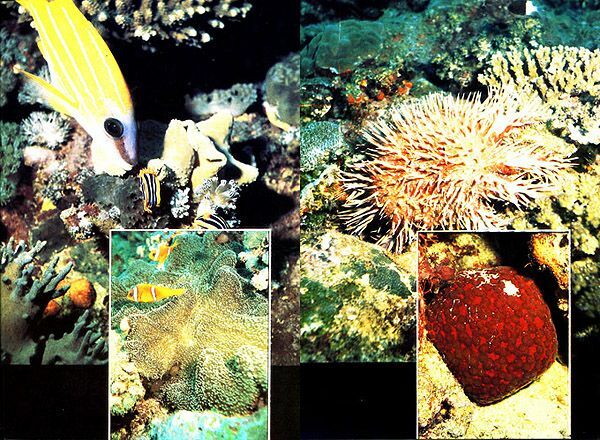 Acanthaster, or a crown of thorns (jewel) is a threatening enemy of corals. This large sea stars, armed poisonous thorns, slowly creeps on a reef, eating up living coral polypuses. After it there is wide track of the lost corals, quickly collapsing under the action of surf (such corals collect). Other stars, such as kulcita, practically inoffensive. Kulcita looks like a bright pillow for needles, lying on a seabed. At a deep marine sea shelf depth. Branchy lime corals do not meet on depths more than 40 meters. The steep slopes of reef are covered, as if by a crust, different types of massive corals, in a number of varicoloured sponges and soft corals which can live almost in complete darkness. In the day-time light barely arrives at these depths, and a man here feels uncomfortably. It not surprisingly - here are in a charge large sharks. In submarine grottoes and caves walls remind a krasno-zheltuyu palette. But looking over this splendour of paints is possible only by the light of lantern. Gorgonaria CORALS. The real reign of horny Gorgonaria corals (horny coral) is on a no-bottom. Gorgonarii does not need abundant sunlight, because there are not symbiotic water-plants in their body. More frequent than all they grow on the areas of reef with a swash, bringing them squeak. The single lashes of corals-whips and elegant large fans, colour-pigmented, are slowly swayed under water on a no-bottom. Looked after, it is possible to notice the great number of shallow white spots on a red fan. These are coral polypuses, formings a colony. BLACK CORALS. One of most famous, black corals belong to Gorgonaria (horny coral). In orients it is considered until now, that they possess magic force. Their horny skeleton is polished and goes to making of jewelry and rosary. Black corals live usually on very no-bottoms are more than 60-70 meters. They sometimes arrive at the sizes of the real trees - about 4-5 meters in high. Living coral polypuses of light chestnut-coloured, and it seems that their branches are covered a tender brownish fuzz. Dark - marine lily.